Teufel may still be the new kids on the block when it comes to selling speaker systems in the UK, but it's already managed to bag a world's first – in the guise of System 5 THX Select 2 home theatre system. 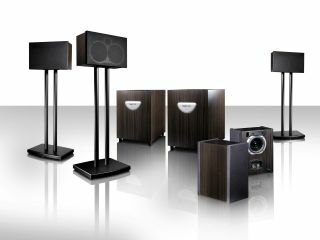 This is the first speaker set to brandish THX's new Select 2 moniker. The select branding is essentially given to reference systems that can blurt out fantastic sound for rooms in the 10-12 foot category, so perfect for your average living room. The System 5 set of speakers consist of three loudspeakers (S 500 FCR) for the front of your room, two rear speakers (S 500 D dipoles) and a subwoofer duo (S 5000 SW) which can knock out bass at an impressive 25Hz. Altogether, the 5.2 setup – because sometimes one sub just isn't enough – will set you back around £1,410, depending on how kind the Euro is being. As Teuful is a direct online seller, you will only find this system by pointing your browser to www.teufel.eu/uk.